We’ll show you how to set up your free Email-to-SMS gateway that will give you the power to receive free SMS notifications in your email inbox and allow you reply to that SMS directly from your email. We’ve partnered with our friends at Mailgun so that you can build this entirely free of charge using your free Mailgun account and your free Plivo account. 1. Forward emails as SMS (sent to your Plivo number) to your email address. Get a Free Mailgun Account: here is where you will receive your Mailgun Access Key. Get a Free Heroku Account: Once you get your account, create a new app and install the free redistogo add-on. If you’re new to Heroku, you can visit the Heroku Getting Started page for all the info on setting up your account. In our example, we will call our app your-heroku-app. Get the sample code: download the sample code (https://github.com/plivo/apps/tree/master/plivomessenger) for the app. Here, we will use Git. Git push the app to Heroku: if you’re not familiar with Git, Pro Git is a free online resource covering all of Git. Your Email-to-SMS gateway will first require you to configure your Plivo Credentials. You can set these config variables in Heroku using your console. Check out Heroku’s variable configuration tutorial if you need help. You can get your PLIVO_AUTH_IDand PLIVO_AUTH_TOKENfrom your Plivo Dashboard. 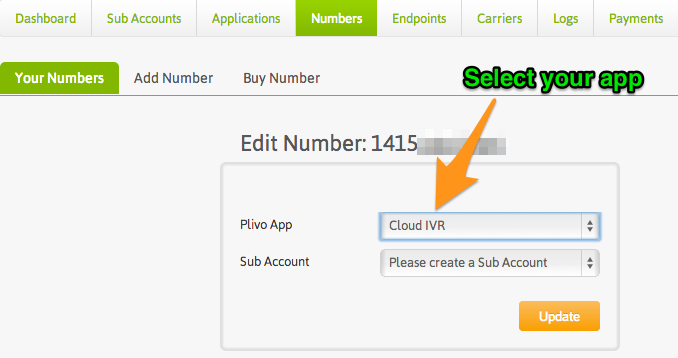 Use any of your Plivo phone numbers found on your Numbers tab in the Plivo Dashboard to PLIVO_NUMBER. If you don’t yet have a number, you can claim your free local US phone number in the Numbers tab if you click on the “Claim your free local US number” link. Assign a Plivo phone number to your app: attach your SMS Enabled Plivo phone number to your newly created “ SMS Forward” application. Go to the Numbers tab and select the phone number you want to use for this app. Then select the name of your app next to Plivo App Click ‘Update’ when done. This is an optional step, but it’s always good practice to ensure that all your code is correct. So before we go any further, let’s run the app locally and make sure everything is working properly. It should display an empty <Response>XML. You can get all of your Mailgun info from your Mailgun Control Panel. First, set up your DNS (Domain Provider or 3rd Party) to allow Incoming emails of your domain (i.e., my.yourdomain.com) to Mailgun. For us, we are showing how to set up our record values on Amazon Web Services EC2 Route53. In this example, the domain is plivo.com and we have set up my.plivo.com as the email domain for this service. A zone editor is similarly available for most domain providers, where the values are set as per the example. That’s it! You’re now free to use your Email-to-SMS gateway! Try sending a SMS to your SMS enabled Plivo number, it should arrive to youremail@yourdomain.com, as configured in the app. The email will have originated from yourphonenumber@my.yourdomain.com. Now try replying to that email, the reply should go back to your phone. In our app, we only let emails forward to numbers we receive an actual request from.